Do you ever remember a time, even some time long ago, when you felt that gut wrenching vibration filling your body, as if some mighty hand reached in and pulled at every muscle within you? It took you far into the cosmos and you followed, but forgot that your body was there on the ground. And the body had become numb, it had frozen in time. Its heart beat had become a slight murmur, barely audible and the breath nothing but a shallow whisper, if that even. There is total numbness from the pain, the fear, the shock, or the humiliation or worse still the deeply ridden shame that did not want to live, in this way, that had to flee as quickly as it could. Suddenly remembering that experience that shook us to the core, that we had to forget lest it rip us apart and send us into a state of utter madness. In that moment we chose death to be our companion but death did not come, because it was not our time. Instead part of our soul departed, leaving us a little less human on this planet, not fully ourselves and not fully alive or even seeking to be. Still as part of that body we continue in the only way we can possibly know, in a mundane state of dissociation and powerlessness. Maybe we get a sense of soul-loss? Feeling as if part of us just isn’t present, that we are missing something in our lives, causing depression, illness and suffering. We begin to get the idea that part of us really is missing and that we need to reclaim that part of us back and we notice a sequence of events begin to take place. We learn that the soul part more than likely left us because of trauma, meaning that it is likely to not be a hugely pleasurable experience. But still we persevere! We learn from most traditions, that it was the shaman who was called forth to assist in our soul retrieval. The one who is connected to the spirit world and is able to send out his/her soul to assist in calling in what is lost. That shaman knows the territory like no other, where its own soul has journeyed many times. We know to embark on this journey, it is our calling, and it is such a strong calling we know we cannot refuse. We ask for guidance and support. Often finding someone to hold the space for us, a a guide we trust, one who knows this journey. We find safety and a trust that reflects this. We know they will be there for us in the aftermath. Deep in our bones and right into the very cells of our body we remember the history and the techniques of ecstasy. We know how it lives within is from deep in our ancestry. Our body calls out for the ‘ecstatic field of energetics,’ remembering that many crafts will take us into the worldly blissful realms of our ecstatic nature. Old and new crafts, ancient and modern, from many societies and cultures. The drum, the dance, the wise women of our western lineage, the machi, the mamas, the healers, the poets, the mystics, the priestess, all with an ability to reach to those spiritual highs, to find the connection to the landscapes of soul, the spiritual realms, the upper and lower worlds and all the places in-between. We are the seeker, looking for something that simply cannot be found on this human dimension, but he seeking is so strong, we cannot let it go and on we search responding to this calling and even within resistance it becomes an obsession! Events begin to happen, we have strong memories, we visit places of our childhood or teenage years. Our dreams are recurring and repetitive patterns or habits keep visiting us over and over again. We try to stop them, or even ignore these irritating behaviours, but not so easy to put the ignoring into practice, we become extremely challenged, desperately finding ourselves wanting to change something, but still it persists. The only way through it is to get fully into it! We know this through the resistance. We have no choice we hear ourselves saying with disbelief! Crazy though it might seem, we delve into these patterns, paying attention to them, being curious about them. Following them, allowing ourselves to be creative with them. What are they trying to tell us? Where did they originate? We might even dance with them and look into how they form themselves and what kind of energy they attract. And as we do this, we begin to uncover the story, the place where we first lost that soul-part. We learn to build a strong ‘container’ a circle as we call it in the shamanic world. Our innate protection and support that has always been with us, surrounding us, forming this protection, it appears to us in any way we want. Maybe as a garden, a circle of fire, ring of stones or just a simple membrane. Our imaginations run loose, our circles become what ever feels comfortable and safe for us. 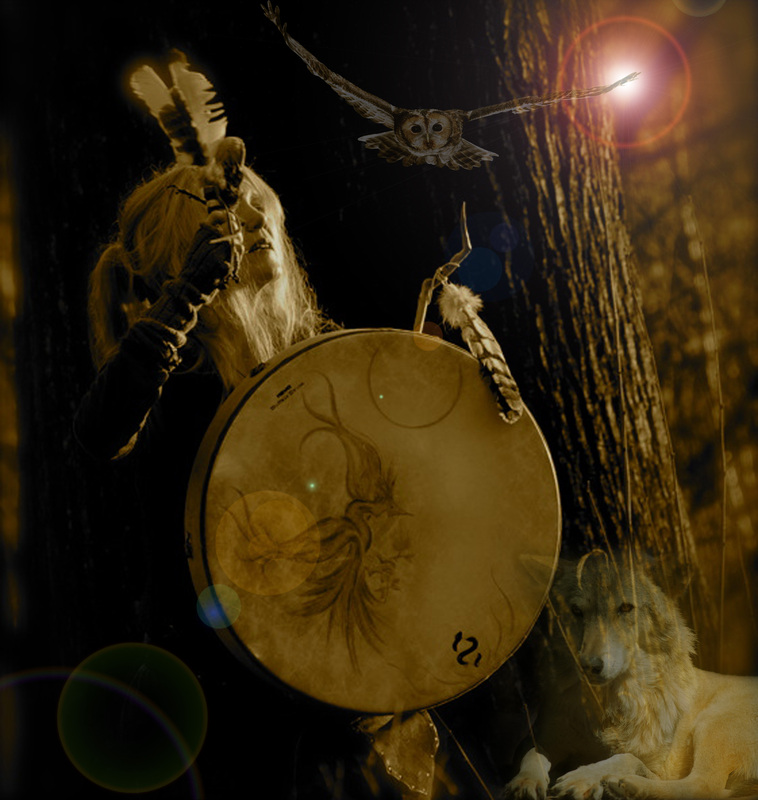 We learn to trust our circle, to hold it dear to us and we begin our journey to soul-retrieval with all that can support us, like power animals and guardians, nature spirits and the spirit of each of the elements. We continue the journey, lighting a candle or the fire for more creative support, asking this flame for guidance. We set our intention, remembering just how important it is to do this on any shamanic journey, whether it is a healing, soul retrieval or just in seeking knowledge from our spirit guides. We continue and allow ourselves to become more and more curious, if we are dancing then we dance ‘with’ all the new information we are gathering, concentrating deeply within our circle and focusing on images and thoughts that appear, that drop in through the ether. Listening to the beat of the drum, 180 beats per minute fast beat focused beat, allowing us to drop deeper into meditation, into the trance, into no-mind, except for any particular thoughts that drop in just like a dream. For some it is not a dance, but a simple repetitive movement, the bones and muscles engaged with the rhythm, whether we are in our own room or on the dance floor, we are focusing our attention, making it as simple as possible. Repeat repeat, repeat, a sway of the hips, a movement of the hand, stomping of the feet and gradually bringing the whole body into the motion, the repetition, the momentum of rhythm. No need to make it a big movement, it is the focus and concentration we are seeking. Even when it is not possible to move the body, we can lie in nature with the drum, or anything else that helps us to stay focused. We drop deeper, beginning to call to us those soul parts, asking for what needs to be received. Calling it in as a golden light, a sphere heading towards us. Becoming a begging bowl for spiritual wisdom, asking for that soul part to be returned to us. We keep focusing on any images and thoughts, any feelings and we open our heart to receive. Sometimes we learn to send out other parts of our soul to help call the other home. And we know how important it is to have a really strong connection to our circle and to our body because of this. We do not wish to space-out or get lost! There is no place for this on the path of reclaiming. We keep reaching outwards, remembering this soul part does not come without weight. We prepare ourselves to receive that weight, to hold it to us, it is not a time to fall, no matter how heavy. And we call in the soul, reminding it we are here, ready to receive, knowing it means we must work on ourselves and our lives. It is not unknown to us that it is very likely the trauma that happened in our earlier life will be brought to our attention and many feelings may be felt that are uncomfortable. We know we may feel a lot of emotion. We know we may have painful memories. But we learn to recognize that this is actually a good thing, we learn to trust that this is so, because it means that we really are doing our work and we need to remain as positive as we can be, reminding ourselves, any memories that hide away in the shadows create dysfunction, causing unhealthy behaviours and patterns. This we cannot allow if we are to heal fully. We do not take our Soul retrieval lightly, we know it is not an easy calling, it is not an easy journey, because we know too well, even if a little unclear, why the soul had to leave in the first place, it was not safe to stay, we know it means having to face the trauma and expressing what was not released at that time. And as we experience that ‘dark night of the soul’ we keep reminding ourselves what it really means to become our whole-self-reborn. And as we recognize the gifts that we were born with, that find their way back to the heart, the body, the mind and the hands of our creative being, we bring to life the treasures that need to flow through us. We begin to remember those gifts, we awaken them. Often by simply following our own creativity, and we find their rituals, marking that territory, its rite of passage that may have been forgotten about by others, even ourselves, when it was at an appropriate time of our life and for sure, no one told us how necessary it was. So we ritualize this returning, giving gratitude and honoring what has passed and we hold ceremony to find its celebration. The ecstatic spirit lives on in us, once known we never forget its medicine and ability to transform our lives. It touches us, moving through us in its divine intervention, altering our states of consciousness as we rebirth ourselves time and time again, triggered into these states, mind altering, body vibrating, we are hollowed and filled in one fell swoop. The mystic within or at our side, humbles us to let go and breath that catalytic source of inspiration deep within us, knowing it will fill us to the core and return us to ourselves and the beloved. Ecstasy is the turning point of our lives, there can be no going back, our heart is opened and those insights that come with us induce the love of God, our connection to Spirit, the Divine. No matter the darkness it will propel us forward, into the arms of heaven. Life lives through us, we become the memory of who we are right now. This entry was posted in Uncategorized and tagged alchemy in movement, ancestors, benefits of dance, brighter futures, caroline carey, ceremony, changes in society, circle, community, crafts, creative writing, dance, dancers, dancing, death and rebirth, deep sense, depression, dreaming, dreams, drum beat, earth, ecstatic dance, elements, embodiment, faith, feminine, femininity, healing, health, heart, medicine men, medicine women, mystics, priestess, shaman, shamanism, shame, soul, soul retrieval, Spirituality, wise woman. Bookmark the permalink.